The bathroom often becomes cluttered with bottles, sponges, makeup brushes, and other accessories. Thrown all over the top of your bathroom vanity, they give the room an untidy room and deteriorate the overall atmosphere. Best shower caddies and shower dispensers can bring some order into your bathroom. 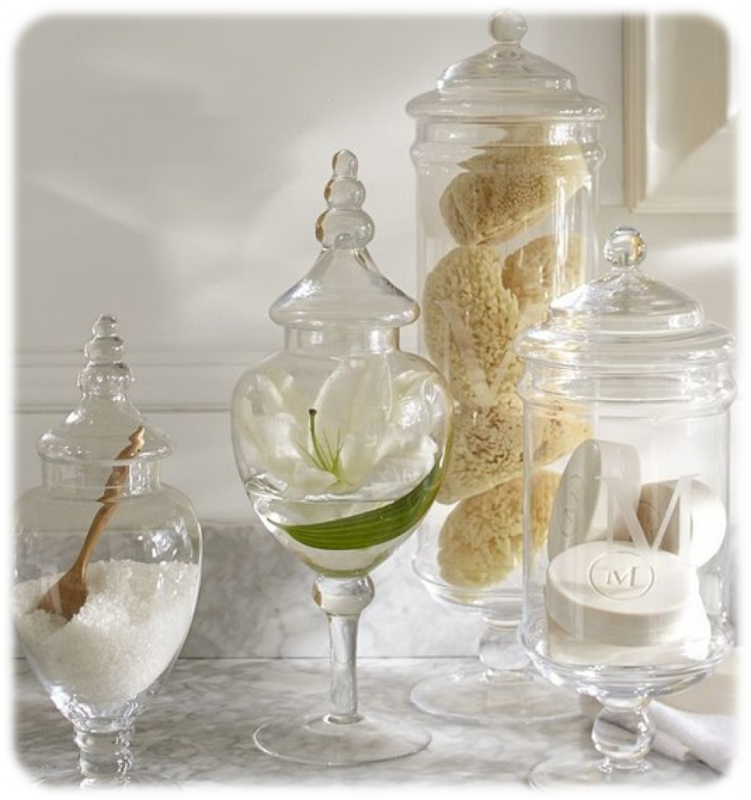 Bathroom canisters and apothecary jars can help you make your bathroom more organized, too. These containers can hold different bathroom and grooming accessories from cotton balls, q-tips, and makeup pads to sponges and washcloths. Apart from being practical, these useful objects look quite stylish. They can bring harmony into the bathroom space and make the room much neater. Bathroom canisters are available in a number of sizes and materials. They come in different designs to match any bathroom décor. Hopefully, our tips and reviews will help you to choose the best set of bathroom canisters. Number of pieces. Bathroom canisters can be purchased as individual objects or as a set. There are sets with a different number of pieces. Most sets include three, four, or five jars. Size. Choose the jars according to the size of objects you plan to store in them. 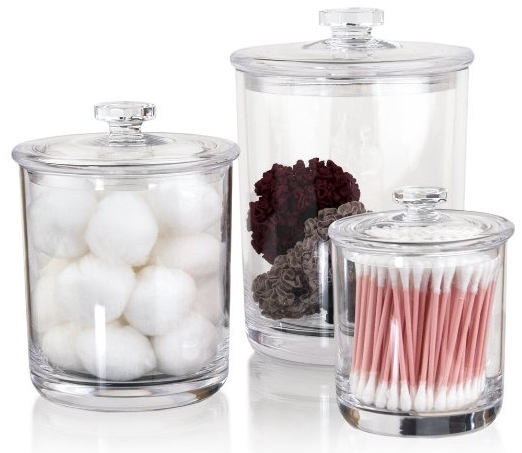 Apothecary jars and vanity canisters come in different sizes, from small to large. The most standard sizes are 15, 30, and 60 ounces. Material. 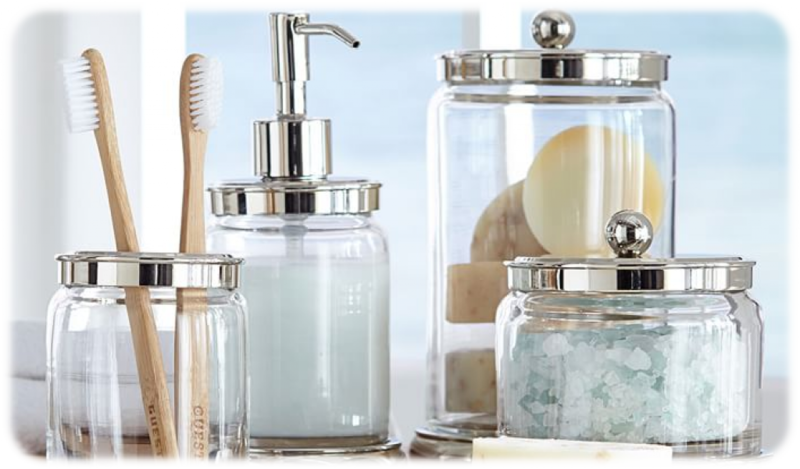 Jars for bathroom accessories are made of different materials. Glass, acrylic, ceramic, iron, marble, plastic, porcelain, steel, and wood are among the most popular materials. All of them are quite durable and aesthetically pleasing. Finish. Bathroom canisters are available in a wide array of finish colors to match any bathroom setup. They can be colorless and clear to create a crisp and clean look. Other colors vary from neutral to bright. Some jars come with metallic accents, chrome, nickel, or stainless steel. Thanks to its neutral design, this versatile set can be used both in the kitchen and in the bathroom. It will be a nice choice for organizing your kitchen pantry, storing cookies, sugar, flour, spices, cereals, and more. You can also use it to store cotton balls, q-tips, and other bathroom things. Made of acrylic, all four jars from this set from Oggi are sturdy and durable. They also look quite stylish as clear acrylic resembles glass and looks quite refined. They come with airtight lids with silicone gaskets to protect contents from moisture. The set includes a 22oz, a 26oz, a 51oz, and a 65oz jars. This stylish set is designed specifically for bathroom use. They are very convenient for holding cotton balls, cotton swabs, makeup pads, sponges, loofahs, and other accessories. The set includes three canisters – 14oz, 18oz, and 32oz. The design of the canisters is quite sophisticated thanks to the glass-like appearance of acrylic and chrome-plated lids. 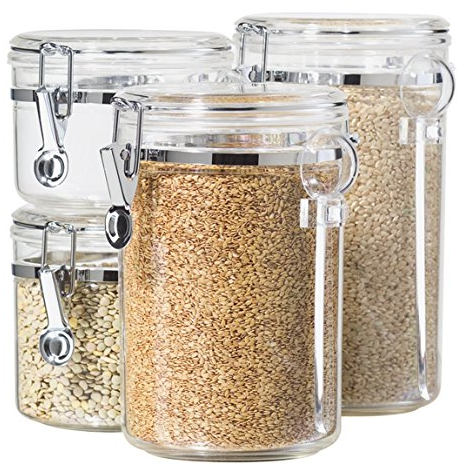 Made of shatter-resistant acrylic, this set from US Acrylic offers a safer alternative to glass jars. The canisters can also be used for decoration – just put seashells, stones, or other natural materials in them and place them on the vanity countertop. This will create a beautiful and fresh natural accent in your bathroom. This is another versatile set of canisters perfect for bathroom and kitchen use. 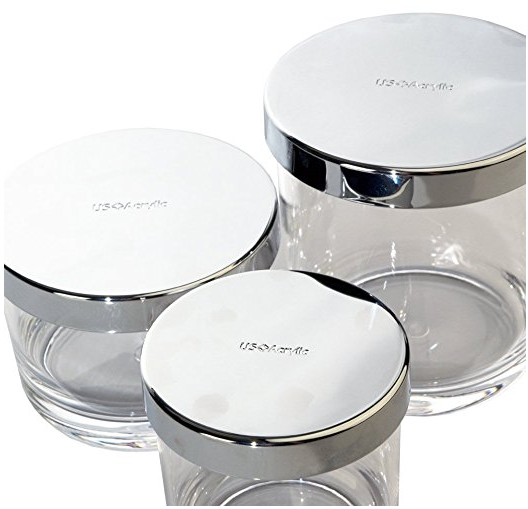 The set includes three jars made of clear acrylic, sturdy yet elegant. Each jar comes with a removable lid made from the same material to complement the canisters perfectly. This apothecary jars set from US Acrylic includes three jars – 15oz, 30oz, and 60oz – that can be used to store different things, from cotton balls to wash clothes, food and decorative elements. The lids fit tightly enough to prevent moisture and dust from getting inside the jars. This set will enhance the design of your bathroom and give it a more organized look. Next Best Potty Chair – Help Your Baby Leave Diapers Behind!